Mexico’s Túnel Emisor Poniente (TEP) II is a study in transitions—much of the tunnel travels through andesite with bands of tuff, below mountain ranges and through fault zones. A final, 1,080-m long section in softer ground provides just 12 m of cover between the tunnel and a residential area. The 5.6-km long tunnel to the west of Mexico City, in the State of Mexico, is also ushering in a new era of wastewater management in one of the most populous areas on Earth. The project is part of a systemic overhaul with the potential to affect the lives of 2.1 million people living in three areas of the Valley of Mexico. The tunnel will prevent flooding in urban areas and will convey sewage to the area’s first wastewater treatment plant. The complex project also required an equally versatile tunneling solution. A Robbins Crossover (XRE) TBM was chosen over a traditional single mode tunnel boring machine. The 8.7-m diameter machine includes features of both a hard rock single shield and an EPB in order to “cross over” into vastly different types of ground. The epic project has been on a roller coaster ride — resulting in everything from national records to slow going in fault zones and unexpected underground caverns. By early 2017, the TBM was facing its biggest challenge yet: conversion from hard rock mode (its configuration for about 80% of the tunnel length) to EPB mode, and tunneling in the final section of low cover soft ground. 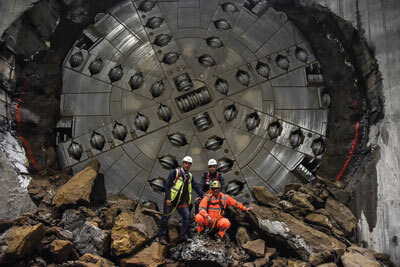 As breakthrough nears, the TBM’s final transition into soft ground is a capstone to the obstacles and successes experienced at this unique tunneling project. The triumphs and tribulations of the TBM excavation are just one component in a key project that could transform Mexico City’s Wastewater system. Once online, TEP II will supplement an existing wastewater line built in the 1970s and further improve the wastewater problems being addressed by other projects such as the Túnel Emisor Oriente (TEO), a 62-km long mega-wastewater tunnel. Both tunnels are being built with a 100-year design life in mind, and are meant to be answers to a massive problem in the Valley of Mexico. Beneath the metropolitan area of Mexico City sits a drained clay lake bed interspersed with volcanic rock and boulders from long dormant, buried volcanoes in the area. Chronic groundwater depletion has resulted in soils that sink as much as 20 cm per year. All that sinking — amounting to as much as 10 m in the last century — has caused the city’s wastewater tunnels to lose their slope. The result is a recipe for massive flooding, and localized flooding each year during the rainy season. TEP II is slated to overhaul the western areas outside of the city, while Túnel Emisor Oriente (TEO) will achieve similar results east of the capital. The project, for Mexico’s National Water Commission (CONAGUA), has a contract price of 2.5 billion Mexican pesos ($126 million US), and was awarded to a consortium of Aldesem, Proacon and RECSA. 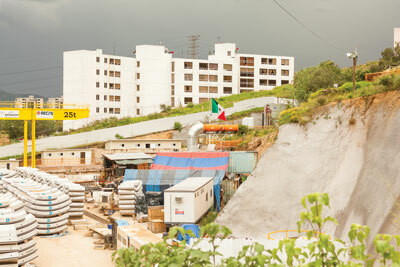 The scheme is a massive undertaking, and the impact of TEP II, despite its shorter length, should not be underestimated: “This deep drainage tunnel will serve to prevent recurrent flooding in Valle Dorado, and will benefit the cities of Cuautital Izcalli, Tlalnepantla, and Atizapan de Zaragoza, which altogether have a total population of 2.1 million inhabitants,” explained Enrique del Castillo of Aldesem. intermediate shaft in March 2016. The Crossover XRE machine selected by Aldesem, Proacon, and RECSA is an ideal technology to handle transitioning ground conditions. It represented a departure from the more traditional types of TBMs that had been used in Mexico (either hard rock or EPB). “There are four main geological groups: Andesites, sandy tuff, dacites, and at the end of the project a limey, sandy tuff. We chose this type of machine because of the geology of the project. Thanks to this machine we are able to switch from hard rock mode to EPB mode in the same tunnel,” said Alberto Martinez, head of the tunneling department for RECSA. The Robbins XRE TBM features components like a convertible cutterhead that can be changed from a hard rock to EPB design, a removable belt conveyor and screw conveyor, and multi-speed gearboxes to increase torque for tunneling through difficult ground. “The benefits of the design are in its exceptional thrust power and in the ease of changing the cutterhead torque. This makes the process much easier should the machine become stuck in difficult ground,” said Martinez. Breakout torque is one way that the shielded TBM can propel itself through fracture zones without becoming stuck – multi-speed gear boxes can be activated to achieve high torque at a low speed, similar to how an EPB operates. With multi-speed gear boxes, the cutterhead can be freed in bad ground where it might otherwise become stuck. In hard rock, the TBM can operate in a standard low-torque, high-rpm mode. The Crossover XRE has other strategies in its arsenal to deal with difficult ground, however. The unique TBM was designed to bore below several valleys with expected water inflows. In the event of a high water inflow, a guillotine gate located on the muck chute is able to seal off the mixing chamber from the rest of the machine. In this way, the TBM can passively hold high water pressures while the crew takes measures to dewater and consolidate ground. Continuous probe drilling is possible on the machine, with a wide drilling range to investigate ground ahead of the machine. In addition to the standard probe drill, a canopy drill provides another ring for grout drilling or forepoling close to the cutterhead and in the top 120 degrees of the tunnel, while a second probe/grout drill is located further back on the machine, allowing two different patterns of holes. The Crossover machine was launched in August 2015 in a hard rock configuration and mounted with 20-in. diameter disc cutters – a risky move given that the first sections of tunnel were in softer soils before the TBM hit more solid rock. “In the beginning, we were worried about the soft ground that was present before reaching the rock. We thought perhaps it could clog the cutterhead as it might be sticky, and we started the machine off in a hard rock configuration. Thankfully this didn’t happen,” said Roberto Gonzalez, General Manager for Robbins Mexico. In fact, the machine’s advance rates picked up quickly, with project records set in December, and again in January after the machine achieved a best day of 42.8 m and a best week of 185.1 m.
Early in 2016, the TBM hit the first of several contact zones, a 30-m wide fault of fractured and blocky rock. While the excavation through the contact zone was slow going, progress picked up again in the more competent andesite rock. After an intermediate breakthrough in March 2016 into an 80-m deep shaft followed by inspection and maintenance, the TBM continued on. By June 2016, the TBM was boring in fairly competent rock and had achieved two national records for TBM advance – one for excavating 57 m in one day and another for boring 702.2 m in one month. While boring in fractured andesite rock in autumn 2016, the TBM encountered a naturally occurring cavern believed to be the result of either a rock fall in a transition zone, or an old, underground lake body that had eroded the rock away. The cavern was approximately 90 cubic meters in size, including about 57 cubic meters of unstable floor area. The TBM was stopped and immediate measures were taken to fill the cavern. “Holes were drilled from the surface to inject granular fill into the cavern, consisting of gravel and sand with grain size of 0.5 to 2.0 in. in diameter,” explained Robbins Field Service Supervisor José Fernández. “Injection of a bentonite, water, and cement grout mixture was then done to consolidate the injected granular material in the cave,” he added. In addition, an expansive polymer was injected through the TBM cutterhead to consolidate ground directly in front of the TBM. The entire process took about two months. Mexico City’s TEP II tunnel will overhaul part of the Valley of Mexico’s Wastewater system, improving the lives of about 2.1 million residents. By the end of October 2016, the TBM had reached the final section of soft ground. In this final zone of low cover, the distance from the top of the tunnel to the surface is less than 1.5 times the machine diameter, and the ground has the consistency of reconsolidated soil. The residential area meant that subsidence had to be kept to a minimum, and the decision was taken to convert the Crossover machine to EPB mode. In order to stabilize the soft soils and minimize the risk of settlement, the tunneling crew drilled and installed 890 micro-piles 27 m in length with 100 cm of separation between them. The pipe used was 8.5 in. in diameter and 0.75 in. thick, made of 550 MPa steel. These micro-piles form a roof over the TBM to provide extra support and safety as it excavates. Conversion of the TBM to EPB mode required multiple steps, explains Fernández. “The conversion process started with the modifications of the cutterhead, adding the piping for the new foam lines, changing the hard rock bucket lips into the EPB soft ground scrapers, and removing the muck buckets characteristic of a hard rock TBM. We changed out the removable plates on the cutterhead to alter the opening ratio from hard rock optimized to EPB optimized (from 7.9% to 18.95%).” Other steps include installing mixing bars into the bulkhead, switching out the TBM belt conveyor to a screw conveyor, altering the fluid system for EPB additives, and installing tails seals and articulation seals for pressurized boring. The machine was completely converted and ready to bore at the start of 2017. “Generally speaking all the processes went according to schedule, with some quite normal delays due to testing of the components in the tunnel,” said Fernández. The machine started its latest section with about 18 m of cover, which was reduced due to the ground slope to just 12 to 14 m. By March 2017, the TBM had performed well, with just 517 rings (about 775 m) left to bore. 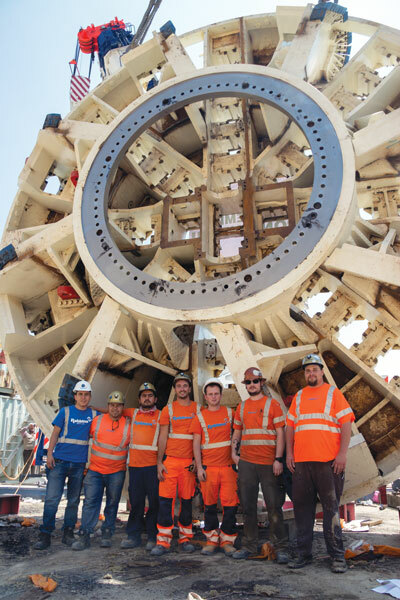 The TBM’s best day of production in soft ground was 13 rings (19.54 m) in only one 12-hour shift. “At this stage, we can say that the conversion was a success as the behavior of the TBM is good, with good performance, and very low downtime.” He added that the advance rates were particularly good considering that boring hours were reduced to between 7 a.m. and 7 p.m. due to the residential area directly overhead. Fernández concedes that the last bit of the low cover section will be particularly challenging. “In the last section of the tunnel (the last 300 m) the cover goes from 12 m to 10 m, and in the last 100 m of tunnel the coverage is reduced drastically to 7.35 m.
Once the machine is through its last section of soft ground, disassembly will present a further challenge. The narrow exit site is flanked by equally narrow roads and nearby houses. The machine cannot be backed through the tunnel and must be disassembled and removed from the exit site using a 400 metric ton capacity gantry crane. Once complete with the TBM portion, the tunnel, lined with 350-mm thick segments, will receive a second continuous concrete liner of an additional 350 mm, making the lining 700-mm thick. The liner will be cast in place using a telescopic sliding form, making the finished inside diameter 7.0 m. Once online, the tunnel will have a drainage capacity of 150 m3/sec. TBM tunneling is expected to be completed in late spring 2017. This article was submitted by The Robbins Company.